Ozone converter is defined as a converter which converts ozone into oxygen. Ozone converter takes energy in the form of electrical excitation of oxygen which pulls apart oxygen molecules. Ozone converters are widely used by airplanes and industrial sector. This technology helps to reduce harmful ozone from the surrounding environment. Global ozone converter market is anticipated to grow at a robust growth over the forecast period. Further, various factors propelling the growth of ozone converter market includes rising adoption of innovative technology to reduce ozone in the cabin of airplane and growing consumer awareness regarding ozone converter for healthcare. In terms of regional platform, North America accounted for the largest market of ozone converter in terms of revenue in 2016. Further, North America is believed to continue its dominance by the end of 2024 owing to rising adoption of advance technology. Likely, the market of ozone converter in North America is driven by various factors such as increasing research and development activities and rapid urbanization. U.S. is projected to dominate the overall market of ozone converter during the forecast period. Asia-Pacific region is expected to be the fastest growing ozone converter market over the forecast period. Japan and China are the leading countries in this region owing growing infrastructure and rising demand for ozone converter from industrial sector to suppress the ozone level. Factors such as growing awareness among the consumers regarding healthy cabin environment and rising demand for ozone converters for industrial sector are believed to be the dynamic factor behind the rapid growth of ozone converter market across the globe. 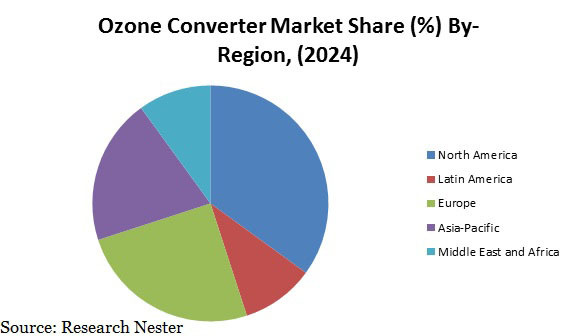 Further, growing adoption of innovative technology in developed and developing nation such as U.S., China and others is projected to foster the growth of ozone converter market. Moreover, rising health and safety regulations from various regulatory bodies such as federal aviation administration (FAA) for the usage of ozone converter in airplanes to suppress the level of ozone at higher altitude is predicted to bolster the growth of ozone converter market by the end of 2024. Additionally, rising incidence of headaches, fatigue, shortness of breath, chest pains, coughing, and irritation of the eyes in airplanes is believed to boost the demand for ozone converter. However, high cost associated with the ozone converter and lack of awareness regarding ozone converter in underdeveloped nations are anticipated to hinder the growth of ozone converter market. Moreover, high maintenance related to ozone converter is also believed to dampen the growth of ozone converter market by the end of 2024.